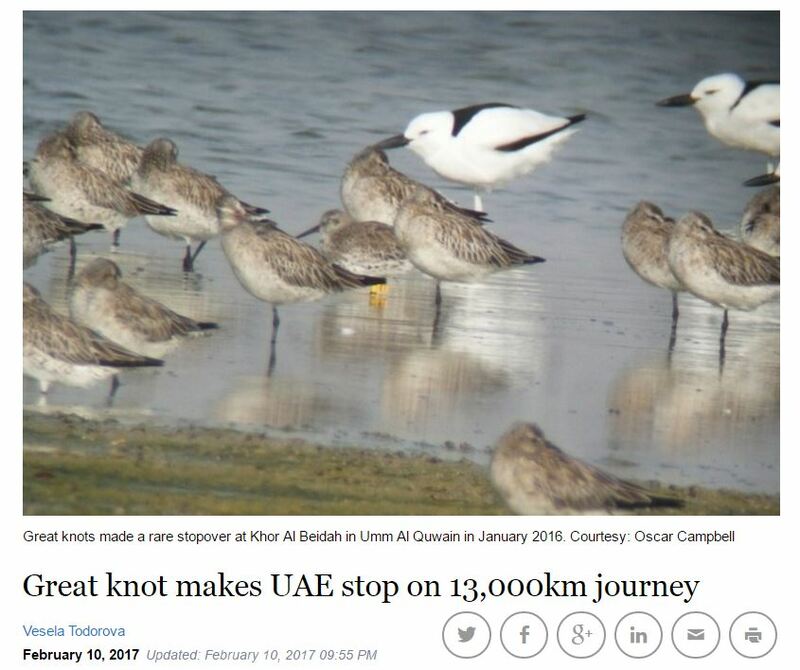 20 Great Knot were recorded in the UAE in January (last month), including one banded individual (E1), which was banded in July on the western Kamchatka peninsula. The sighting of a great knot in Umm Al Quwain has yielded valuable information for a Russian conservation programme. A small wader with light brown plumage, the bird breeds in Siberia and winters in Australia. The Arabian Gulf is at the westernmost extremity of its wintering range and UAE sightings are rare. When Oscar Campbell visited Khor Al Beidah on January 20, he was thrilled to see about 20 great knots at the wetland. One of the birds had a yellow ring, engraved E1, on its leg. The Abu Dhabi resident, chairman of the Emirates Bird Records Committee, set out to find the scientist who put the ring on the bird. He searched online for details about marking schemes and found Australian scientist Chris Hassell, to whom he emailed details about the bird. “It was not one of their birds but he thought it was from a scheme in Russia and forwarded the mail to his contact there,” Mr Campbell said. Dmitry Dorofeev works at the All-Russian Research Institute for Nature Protection. He is studying Great and Red knots, as well as other species in the Kamchatka Peninsula. “These birds are declining in numbers because of tidal ­reclamation at the stopover areas in South Korea and China,” said Mr Dorofeev, whose study is partly supported by the Mohammed bin Zayed Species Conservation Fund. E1 was banded on July 28 at the Khairusova-Belogolovaya estuary, where birds gather at the end of June before migrating in late September. Mr Dorofeev last saw E1 on August 11. “The sighting made by Oscar Campbell is interesting,” said Mr Dorofeev, who estimated that the bird must have flown about 13,000 kilometres, making several stops to refuel along the Yellow Sea coast and in India. “Now we know at least a part of the Great Knot population that winters in the Gulf start their migration from Kamchatka estuaries,” he said. For Mr Campbell, the sighting reinforces the conservation value of Khor Al Beidah. The mangrove, which supports a great diversity of resident and migrant birds and other species, currently lacks formal protection.